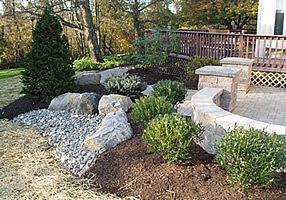 Every landscaper has their own style of bed construction and plant materials. Paverscape inc. excels in this facet of landscape design. We design every job like it’s our own, keeping in mind the balance of color throughout each season. Every tree, large or small... every plant, and every perennial, is hand picked for each project. Spacing is also an essential element of design, leaving enough room for the plants to grow and mature. Paverscape Inc. provides residential and commercial Landscaping services throughout the Lehigh Valley, Bucks and Montgomery Counties. From distinctive landscape design to projects integrating hardscaping, we specialize in improving your outdoor living areas. Make your outdoor areas both beautiful and functional. Contact Paverscape today! Click on thumbnail images below to view a larger version.